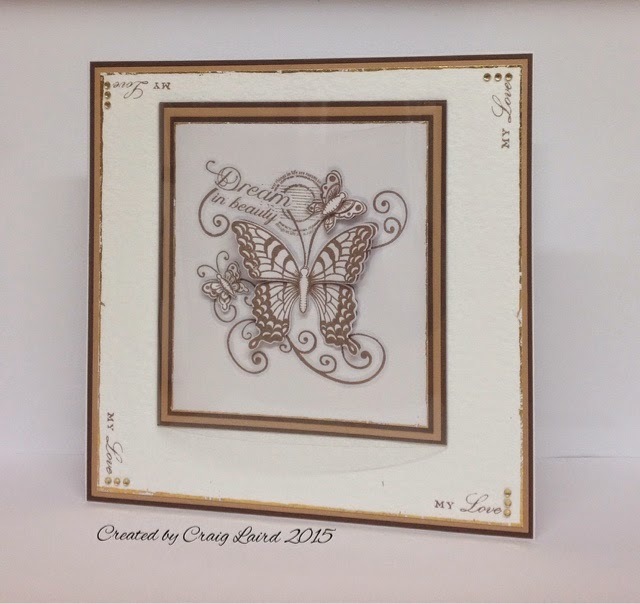 Crafting With Craig: Butterfly buff - My Love 8x8 card. Well easter weekend is here. Hope you all have a lovely long weekend what ever you get up to and if like me you are working, I hope you still manage to have a lovely time. A few months back I bought the Chameleon pendms when they were the pick of week on Create and Craft. With that I added a Heartfelt Creations rubber stamp and its looks gorgeous. I havnt got round to using the stamp so decided the other night to sit and use it. I kept it simple by stamping it just with a Rich Cocoa brown ink. I re stamped the image twice and cut out certain elements to create a decoupage 3D effect. I went round all the edges of the stamped image with a grey pen.nIf your still not confident enough with shading and colouring like I am. Using a grey outline really helps makes the stamped image stand out. It was stamped on White Supersmooth card by PaperMill Direct. With the edges of the White Supersmooth card, i roughly went round them with a quicky glue and when the blue turns to clear and tacky I rubbed some of the gold foil by stix2 to give a rough gold texture edging and then matted and layered onto Mocha brown and Buff coloured card also by PMD. The main 8x8 front is White Hammered card and I also went round the edges with the glue pen and foil. Then matted and layered on the same card stock. I wrapped a piece of acetate over the front, stamped a sentiment in all 4 corners and added a few gold gems. Buff smooth card - 240gsm? White card hammered - 255gsm. Shiny transfer foul set - S57067(used gold). Clear project acetate (100 Microns) - S57132. Quicky glue pen - Sakura. "Dream in beauty" red rubber stamp - Heartfelt Creations. "My Love" clear stamp - own stash. Rich Cocoa ink pad - Memento. Cool Grey (CG8) - Chameleon pens.